Since forming the Tutor/Mentor Connection in 1993 a major goal has been that others adopt the strategy and use their own resources to help volunteer-based tutor/mentor programs grow and impact the lives of youth and volunteers in different parts of the Chicago region. Colleges and universities are an ideal host for Tutor/Mentor Connection teams, especially since they are located geographically in different parts of the Chicago region. If you browse this section of articles you can see many that have been written with this goal in mind. Many universities have vast resources that could be supporting the long-term mission of the Tutor/Mentor Connection and Tutor/Mentor Institute, LLC, but in most cases, there is no central coordination drawing these resources into collaboration. Instead there are "silos" and "competition for resources" that reduce the long-term impact. Here's an article illustrating this potential, written by an alumni from Northwestern University, who served a one year fellowship with the Tutor/Mentor Connection. 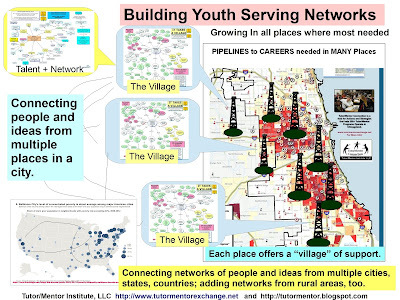 This includes a map of the different departments at Northwestern University who could be working individually with Tutor/Mentor Connection, or collectively, through a University Tutor/Mentor Connection partnership, to help more kids from poor neighborhoods go from first grade to first job, with college a step along the way. Many universities, such as Loyola University Chicago, have launched Centers for Experiential Learning to support the engagement of students, faculty, and possibly even alumni. At the University of Wisconsin-Parkside, this is called the Center for Community Partnerships. At University of Wisconsin-Parkside the Center has taken the lead in helping a Mentor Kenosha Racine strategy develop. 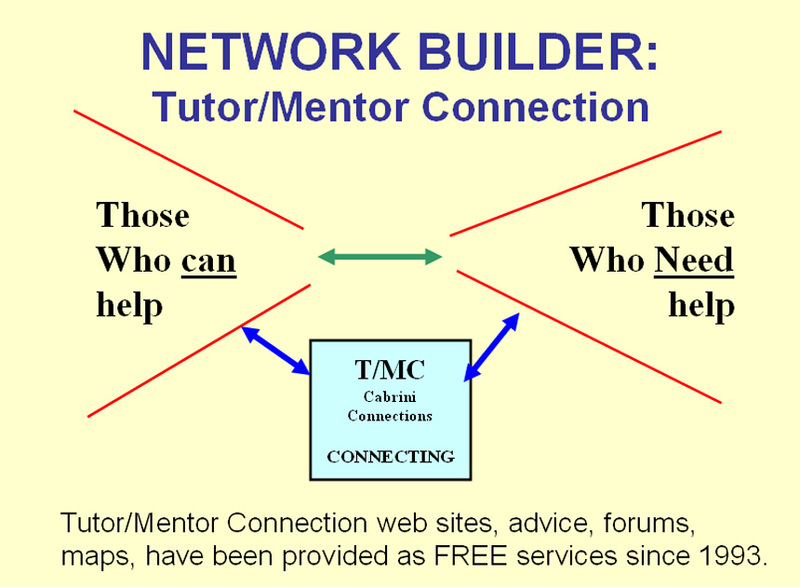 It's been the goal of the Tutor/Mentor Connection, and the Tutor/Mentor Institute, to work with universities all over the world, and connecting them to each other via web forums and knowledge sharing. All it takes to get started is for one faculty member, or student, to join us on our Tutor/Mentor Connection ning site, and begin learning what we do, and sharing this with others. a) What is the Tutor/Mentor Connection? What is the Tutor/Mentor Institute? b) What are the questions we're asking and that we need help in answering? c) What are the questions we're not yet asking, that you might begin to ask, based on your growing involvement with the T/MC? d) What are the opportunities? e) How can involvement with T/MC benefit the university, its students, its alumni, its donors, and the general community and society? There's already a model for this type of student investigation. The presentation below was created by an intern from Illinois Institute of Technology, as part of a six week internship. At this page you can find many visualizations done by interns and on this page, many articles written by interns. In most cases, the people teaching at a university don't know much about the Tutor/Mentor Connection, and have not given much thought as to ways students could have a meaningful role with us. I'd like to create a learning process that leads to a better understanding of the Tutor/Mentor Connection and strategies that have been developed over the past 20 years, which could be lead by teams from any university. Finally, this should be thought of as an on-going project. We both learn from the experiences of the first students, and use that to improve the design of the University engagement, so that each successive student benefits more, and contributes more to the success of local volunteer based tutor/mentor programs around the university, in Chicago and in other cities, through support given by intermediary organizations like T/MC. 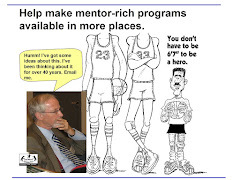 In the early 2000s a team of graduate students at DePaul University developed a presentation, intended to serve as strategic planning for a University seeking to form a Tutor/Mentor Connection. I've updated that several times and now it is available for a small fee, on Scribd.com. If you'd like to meet with me to discuss this idea, let's connect on-line or suggest a time when we might meet here in the Chicago region. This is a great program that you have put together. A selling point for universities should be that for virtually any profession, the ability to communicate well and teach someone a skill is absolutely essential. Best of luck with this!